Wedding bells are ringing this coming new year! 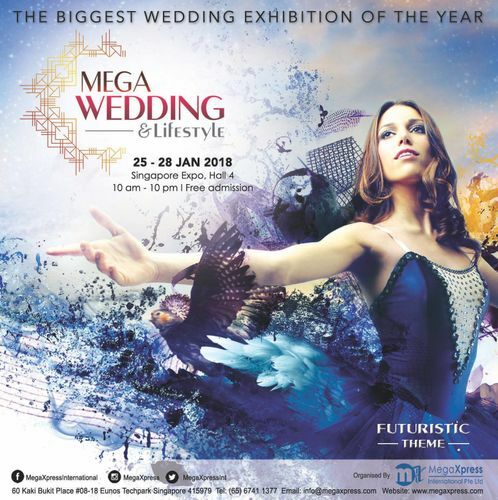 Mega Wedding & Lifestyle 2018, our most awaited and highly anticipated exclusive Wedding Exhibition is back! The only biggest bridal exhibition that houses 230 exhibitors all under one roof showcasing the best in the wedding industry with products and services ranging from bridal services, wedding venues, hoteliers, restaurants, caterers, wedding gifts & favours, wedding photographers and many more! Expect exclusive wedding set-ups by top and renowned wedding vendors not only in the local industry, but from Malaysia and Indonesia as well! Be captivated by their impressive decorations and impecable services as you enter the 5,000sq metre hall, which is elegantly decorated to suit a unique theme every Mega Wedding & Lifestyle Exhibition. Aside from enjoying bridal showcases and competitions, you'll also enjoy exclusive perks once you book your wedding with these vendors! Do check out our very own Celebrands Booths specially attended by popular overseas Celebrities such as Siti Sarah, Emma Maembong, Ifa Raziah, Raja Ilya, Jue Aziz, Roslan Shah and many more promoting their own brand of products. Mingle with them and catch them live at their very own Celebrands booth. Come on down and make your dream wedding come true!